(Office of Her Majesty, Press Department, New York) During the Fifth Annual Clinton Global Initiative (CGI) meeting in New York, Her Majesty Queen Rania Al Abdullah took to the stage to pledge her commitment to leadership for the 1GOAL Education For a All Campaign over the next year. 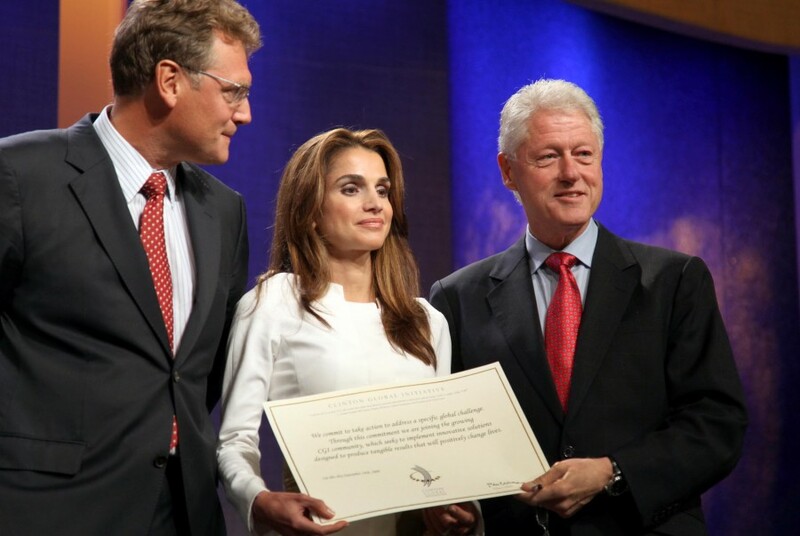 Queen Rania, co- founder and global co- chair of 1GOAL campaign, was introduced by President Bill Clinton and joined by Bono, lead singer of U2, actress Jessica Alba, and leading global CEOs including, Jérôme Valcke, General Secretary, FIFA; Jürgen Griesbeck, CEO of streetfootballworld; Richard Edelman, President and CEO of Edelman PR; Bruce Sewell, Intel Senior Vice-President; Tae Yoo, Cisco Vice-President, and GCE President, Kailash Satyarthi. As co- founder and global co- chair, Her Majesty will continue to advocate on behalf of children who are denied an education and the future it provides. The 1GOAL campaign is an Education for All initiative in partnership with FIFA in the run up to the 2010 World Cup. The campaign seeks to ensure that the 75 million children out of school in Africa and the world’s poorest countries get access to classrooms, teachers and quality education. 1GOAL calls on football fans in over 200 countries to sign their names at www.join1goal.org and encourages world leaders to keep their promise of giving everyone access to education by 2015.